Is it even news anymore? With so much attention given to the military applications of unmanned aerial vehicles (“UAVs“), sometimes negatively referred to as “drones,” it was welcome news to see a report about the extraordinary and do-able commercial applications for sUAS – small unmanned, autonomous systems. To Amazon CEO Bezos’s credit, this is not around the corner, but some (the author of this blog) posts senses a certain inevitability to sUAS operations. 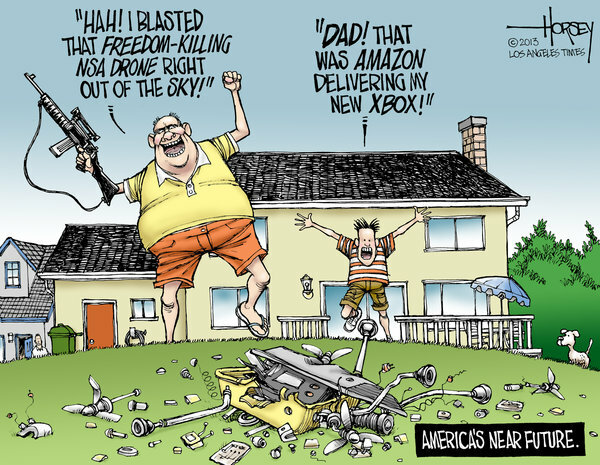 Could Amazon use a “drone” to deliver a package to a busy New York apartment building. Likely not – Bezos nowhere claims that is the objective. While the technology exists, the law lags – even with the Federal Aviation Administration’s recently published “roadmap” for UAS integration. We think the purpose to be served is both public and municipal. A city acts for city purposes when it builds a dock or a bridge or a street or a subway. Its purpose is not different when it builds an airport. Aviation is to-day an established method of transportation. The future, even the near future will make it still more general. The city that is without the foresight to build the ports for the new traffic may soon be left behind in the race of competition. Chalcedon was called the city of the blind, because its founders rejected the nobler site of Byzantium lying at their feet. The need for vision of the future in the governance of cities has not lessened with the years. The dweller within the gates, even more than the stranger from afar, will pay the price of blindness. Safety first. Privacy rights, too. Nobody is saying otherwise. But, imagination and creativity and leadership are required in this particular aviation sector, not the standard legislative process, which in fact is creating uncertainty among commercial sUAS manufacturers and operators. As practical matter, it should not be the case that lawyers are giving their sUAS clients drastically different regulatory advice — differences that exist not on the basis of legal interpretation but on the tolerance for risk in complying with vague standards or else flying and seeing what consequences, if any, might happen. Posted in UAV and tagged Amazon, Besoz, FAA, Ravich, Roadmap, sUAS, UAS integration, UAV on December 8, 2013 by Timothy M. Ravich.